Here’s a subject that I’ve been wanting to blog about for a while now. Self defense. Specifically, the most effective self defense option: Handguns. I am a gun lover plain and simple. 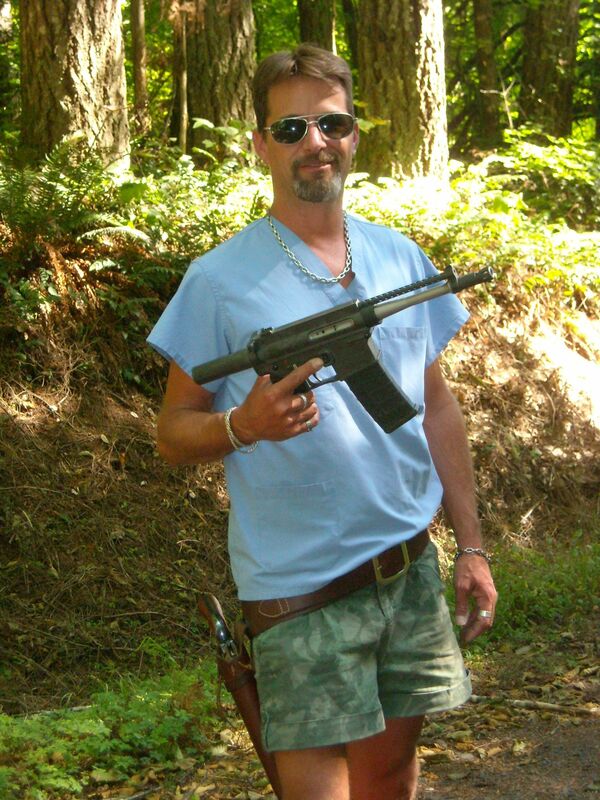 I was a gunsmith and federally licensed firearms dealer and manufacturer. I was a unit armorer in the United States Army, a military gunsmith, serving with the field artillery, “King of Battle”. I have been collecting firearms for more than 20 years. I live in the forest where I, and my friends, can shoot on the property at any time we like. I met my wife in the Army on a firing range. She can outshoot me with many of the weapons we own. We are up to five gunsafes now and really need a sixth. We likes our guns! Handguns are an effective means of self defense that can be employed by anyone. I have trained a wheelchair bound woman, who is darned close to quadraplegic, to use, and use well, a revolver. The only person I can’t train is one who refuses, for whatever reason, to touch a firearm. Good luck with that pepper spray… The first rule of a gunfight is to bring a gun. Nuff said? It doesn’t matter if you’re a man or woman, straight, gay, or bi, we all are potential victims of violent crimes. Steps can, and should, be taken to reduce our exposure to these crimes but there is always the chance of a random encounter that might just put your life on the line. Carrying a firearm for self defense carries great responsibility. I won’t go into this as there are many who are more qualified to give you that information better than I could ever could. A quick google search will return many options. I may post some links on this in a future post. This post is simply to share what works for me and Sweetpea. Handguns that suit our tastes and needs. Here are a couple of handguns that we own and carry for defensive purposes. My preferred piece is the Taurus Millenium Pro PT-145 in .45ACP (.45 Auto). It is lightweight, ultra compact, has a high capacity (10 rounds), can fit in the waistband of virtually everything I wear, and has a cavernous bore that can throw a very big bullet at very bad people. 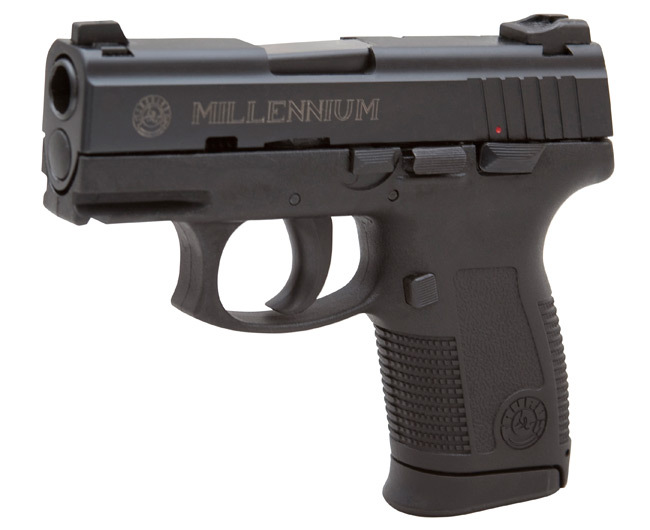 Taurus Millenium Pro PT-145 on the Taurus website It’s about the largest caliber in the smallest package that you can carry. 10 rounds is a lot. I hope I never even have to fire one round, but it’s good to know that round has 9 brothers to back him up if he needs it. This is not designed to be a target grade handgun but it can hold its own. It will shoot a 3 inch group at 25 yards if I do my part. 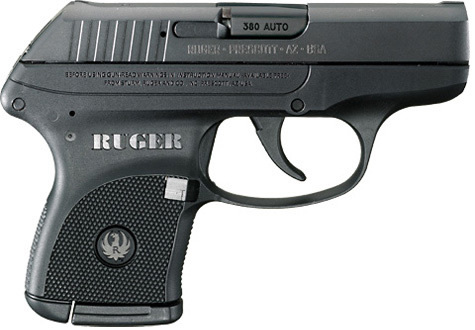 Another handgun we carry is the Ruger LCP in .380ACP (.380 Auto). LCP stands for Lightweight Compact Pistol though I like to call it the “Little Cute Pistol”. Cute but effective… Some debate the effectiveness of the .380 Auto as a defensive round. I don’t know about your tolerance but I don’t function well with any size holes in me and would quickly lose my motivation after the first hole was installed in me. Chances are that bad people have similar preferences to mine with regard to close range lead poisoning. This handgun is incredibly small, small enough to be entirely concealed behind my open hand, super lightweight, I can carry it in a shirt pocket quite easily, and has a capacity of seven rounds. This is the one I drop in my pocket when I’m making a large cash withdrawl at the ATM, running into the quik-mart, or even just strolling around the property. It’s only a touch over 5 inches in length and a hair over 3/4 inch thick. Teensy. Feel free to leave questions with the comment feature. I’d be happy to offer what advice I can to those interested. If there’s any interest, I may, in a future post, share some home defense options in the way of shotguns and rifles. You’ll note that I do not refer to any “less than lethal” options for self defense. It’s because I don’t believe in them. Period. If you want to face down a desperate thug, someone desperate enough to pull a knife or a gun on you, with a can of Mace, a puny knife, or a flimsy baton, that’s your choice. I will do everything in my power to return home each day when I leave the house. It’s not a matter of killing, it’s a matter of surviving. Foxfur plinking with a Professional Ordnance Carbon-15 pistol in .223 Remington. 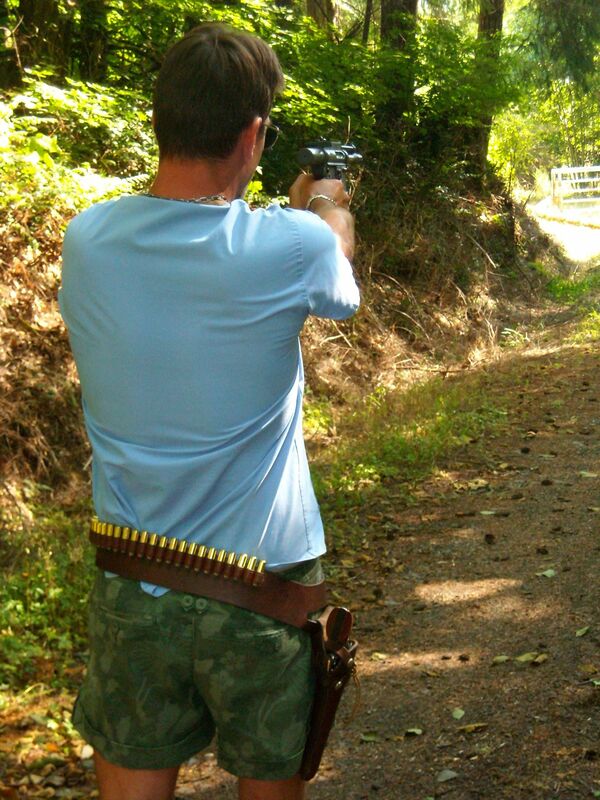 A Ruger Vaquero in .45 Long Colt is slung around his waist. The Carbon-15 is a carbon fiber, instead of aluminum, AR-15 pistol that fires the .223 Remington / 5.56mm NATO rifle round, the same round as our soldiers fire in their M16 / M4's. This is another favorite pistol I carry when hiking around on our property. Fun!